[Tutorial] How to get free domain(.com.np)? This is my first post in this blog. I manage lots of other sites but have never helped other to get their one. We often visit lots of sites and wish to get one like those. 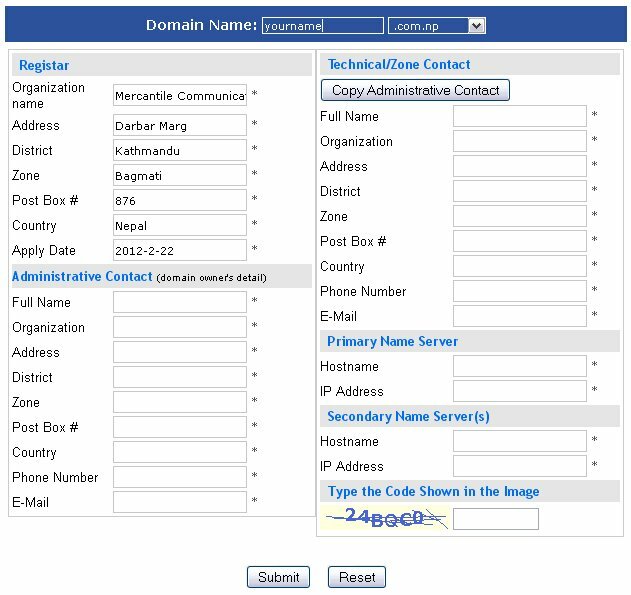 In this tutorial I am writing about the way to register free domain .np which is ccTLD and belongs to Nepal. I will further help you to make website with different management systems and custom made sites on your request. So let us start this tutorial and its not so difficult to get website because I too don’t belong to this field. Step 1: Go to the link http://register.mos.com.np and check domain for availability. For host name field enter the DNS name provided by your webhost. Eg. “NS1.WEBHOST.COM” and “NS2.WEBHOST.COM” and IP address is not necessary. If you want it to enter then open your CMD from start menu and type ” PING NS1.WEBHOST.COM” where your get the numerical value separated by dots. Step 3: After filling the form you can submit it. respective government bodies for official domain name. You can find the Mercantile Communications Office address at the bottom of the site. That is it and you got the free .np domain for life time.